So I wasn't sure about this local staging of Monty Python's Spamalot since the material is a little challenging as is the nature of British humor, especially when it comes to the unique brand of comedy that Monty Python is known for. I'm aware that the musical isn't quite an "authentic" Python experience for some, but it is a fun enough tribute piece that celebrates the Python legacy. But I'm still a Monty Python fan and I couldn't let the opportunity to see this show slip by. Tobie was quite supportive of this and it made for a fun Sunday afternoon with a good number of geeky friends who also love Python humor. The main quirk of the show was the decision to go with free seating, a move that producer Joel Trinidad explained was done in the hopes of inspiring patrons to be early. But combine that with show buyers who implement reserved seating anyway and you end up with annoyed ticket holders like us who purchased through Ticketworld and ended up with some really terrible seats. Mr. Trinidad apologized, which sort of helped but it didn't change our seating situation when we watched. 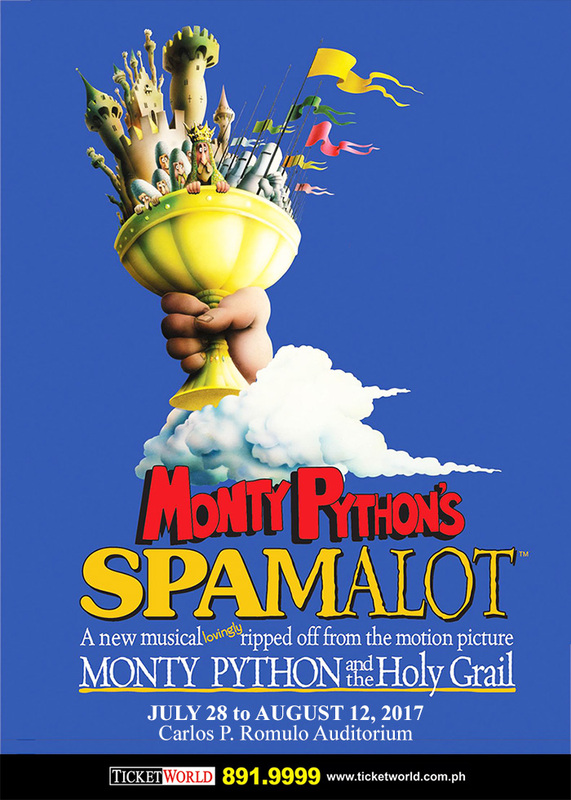 Synopsis: Monty Python's Spamalot is a comedic musical adapted from the 1975 movie Monty Python and the Holy Grail along with material from various episodes of the classic Monty Python show. Music was by John Du Prez, Eric Idle, and Neil Innes while Idle also wrote the show's book and lyrics. The Upstart Productions staging was directed by Joel Trinidad and Nick Trivino and was staged at the Carlos P. Romulo Auditorium at the RCBC Plaza in Makati City from July 28 to August 12, 2017. After getting past some confusion about whether this play is about Finland or England, we meet King Arthur (Lorenz Martinez) and his servant Patsy (Domileo Espejo) as they travel the land looking for knights to join Arthur and sit at his very round table. It's not an easy journey but with the help of the Lady of the Lake (Rachel Alejandro/Carla Guevara-Laforteza) they eventually gather some good knights to join him in Camelot. But the knights need a quest to given them purpose in life and they end up seeking the Holy Grail. Along they way the knights deal with all sorts of challenges including the French, the Knights Who Say Ni and the Black Knight, to name a few. How they get through all this without laughing at their own jokes is really what drives the play. What I Liked: The musical has a lot of Python goodness from both the movie and the original TV series. So it's not enough to talk about the average flight speed of an African swallow, but one must also mention that it has lovely plumage. The writing is clever and almost non-stop with it's jokes and it makes for a refreshing, somewhat more cerebral comedic experience. It's hard not to love Rachel Alejandro's performance as the Lady of the Lake as the character has long been a fan favorite. But she really milked the role for all its worth and the result was a heck of a lot of fun. At the same time we have the likes of Espejo's Patsy being such a brilliant character in the show and managed just the right sarcastic looks and gestures and delivered a lot more comedy without words. And a lot of the efforts to localize the play were pretty fun as well. It helped make the performance feel distinct for this Manila staging. What Could Have Been Better: Timing is always a key part in comedy and there were a lot of times when it felt like the performers were more determined to deliver their lines instead of delivering their jokes. Thus there were a lot of cases when punchlines were delivered too soon while the audience was processing the joke or other instances when there was no breather or pause to give people a chance to laugh before the next bit of dialog begins. And for a show that behaves more like an ensemble comedy, not everyone could really hold their weight. Arthur wasn't too bad but he also wasn't the strongest character either. Certain character actors in the show really stood out and did well in terms of making the show funny while others couldn't get their jokes to land with the same degree of impact. 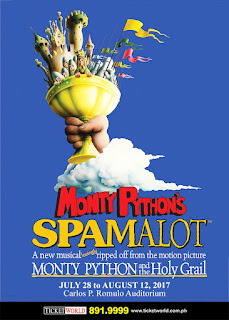 TL;DR: Monty Python's Spamalot is a hilarious play and a great celebration of the quirky comedy of the Monty Python brand of humor. It's not a perfect staging and I don't understand the insane asylum framing device that they tried to use but at least it makes for an entertaining evening. Thus the show gets 3.5 crazy meta-songs out of a possible 5.